My name is Jennie Härsjö Lundh and I live with my husband, our son William and our cats in a small house in Stenungsund. I have always been interested in cats and have been raised on a farm with a lot of cats and other animals. The interest in the breed of British Shorthair was raised by a special cat called Tusse. Tusse lived with us for several years and I really loved his temperament. When I moved into My own appartment I decided to get me a cat. An add in our newspaper led me to Tessan. She was a really miserably, hungry cat. She had been abused and thrown out of her house. She lived under a tree and survived on leftovers and seeds for birds. Tessan moved strait into my and Christians heart! After a year we decided to add another cat to our household and it was time for Saga. Saga came from Kortedala just outside Göteborg. During the summer of 2009 I decided it was time to add a youngster. During a vacation trip to Stockhom we went to visit Britt-Marie and her Silver Tabby kittens. Off course we fell in love with one of them. So Pricilla moved in to us in September 2009. That was the start of the cattery. My cattery name has been approved by SVERAK on the 20th of May 2010. During October 2010 our first litter was born. 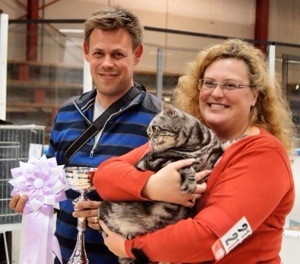 I recieved my SVERAK breeder diploma on the 24th of February 2011. The hope is that SE*Forever Loved will bring beautiful, healthy Loved British Shorthairs. Since 2013 Im a member of FiFe Breed Council for British Shorthair.